Amulets and talismans are a physical representation of a positive affirmation, desire or prayer that the subconscious understands. The subconscious will try to guide you to the intent of the amulet or talisman. They are created by a persons force of will and by applying the appropriate symbolism (correspondences) that represent the affirmation, desire or prayer. Amulets are for keeping something away from you and Talismans are for bringing something to you. The wearer of an amulet or talisman is many times only aware of what it is meant for and their belief and subconscious does the rest. So…how does music fit in here? The subconscious is the key. I have read the subconscious is like a child. It is very literal, does not understand “NO” or “NOT” and likes flashy, colorful things. Programming your subconscious with affirmations, desires or prayers is easier when you take advantage of its childlike behavior. You need to trick your conscious mind to focus elsewhere so the subconscious can listen. With musical talismans your conscious mind hears music but your subconscious mind can listen to the embedded instructions. Instead of using the physical form of an amulet or talisman, I convert all the appropriate symbolism (correspondences) into music. As a short MP3 we can listen to our favorite positive affirmation, desire or prayer when ever we want. We can easily program it on an MP3 player as part of a play list or even as a ring tone on our cell phones. If you listen to binaural beats, subliminal messages in soothing music, pray, chant, repeat positive affirmations, cast spells or even create your own talismans and amulets you already understand the concept and beauty of musical talismans regardless of your beliefs. Even those that only believe in science probably already understand that the workings of the subconscious play an important part in our daily lives. This is a concept I have been working on since I started writing music. 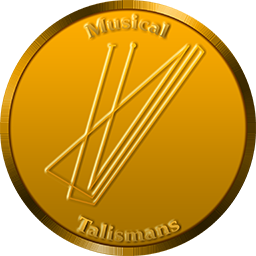 It has recently come to fruition as a separate project called Musical Talismans. I use a method I call Talismanic Composition to convert the desired effect into short 15 to 30 second “songs”. They are quickly and easily listened to. No vocals, no subliminal messages, just instrumental rock music only. So sit back, listen to one or play several together and spend a few seconds listening to a better life. The purpose of this talisman is help you feel good and to be happy. The purpose of this talisman is help you have a good day at work.